Violet Candypop Buds are purple Candypop Buds found in Pikmin 2. They behave just like any other Candypop Bud, but when non-purple Pikmin are thrown in, they will change into Purple Pikmin. Candypop Buds are the only method of obtaining White Pikmin and Purple Pikmin. If Purple Pikmin are thrown in, they will be reverted to leaf stages, and don't count against the five Pikmin limit per Candypop Bud. 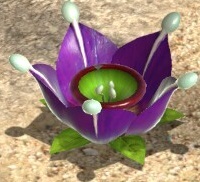 This plant is essential to the completion of Pikmin 2, as collecting the heaviest treasure, the Doomsday Apparatus, requires 100 Purple Pikmin. This plant reappears in Pikmin 3 but is the one of the rarest Candypop Buds in the game, with only a one appearing in Mission Mode's Thirsty Desert, and four in Bingo Battle's Blooming Terrace. The following is a list of all the locations of Violet Candypop Buds in each game. In Pikmin 2, if a player collects five Purple Pikmin from each plant encountered as they go along, without repeating caves, they will be able to nearly reach 100. However, if a player wishes to build their number of Purple Pikmin later, choosing the right cave will greatly speed up the process. Subterranean Complex is recommended if the player first needs more Pikmin to convert, as Queen Candypop Buds are present. However, if a player doesn't need or want to grow more Pikmin, such as in a 101 Pikmin run, Bulblax Kingdom would be the fastest option. To note that many Violet Candypop Buds disappear after the player's total amount of Purple Pikmin has reached 20, as explained here. Using Bulbmin is also convenient for growing Purple Pikmin, such as in Submerged Castle, where Purple Pikmin are needed to defeat the boss – the Waterwraith. Emergence Cave: Two on sublevel 2 (if the player has less than 20 Purples). Frontier Cavern: One on sublevel 1 (if the player has less than 20 Purples), one on sublevel 4 (Bulbmin available), and one on sublevel 5 (Bulbmin available). Hole of Beasts: Two on sublevel 2 (if the player has less than 20 Purples), and one on sublevel 4. Bulblax Kingdom: Two on sublevel 4, and one on sublevel 6. Snagret Hole: One on sublevel 3. Citadel of Spiders: One on sublevel 2 (if the player has less than 20 Purples). Glutton's Kitchen: One on sublevel 2 (if the player has less than 20 Purples), and one on sublevel 5 (Queen Candypop Bud available). Shower Room: One on sublevel 2 (if the player has less than 20 Purples), and one on sublevel 5 (Queen Candypop Bud available). Submerged Castle: Two on sublevel 5 (Bulbmin available). Cavern of Chaos: One on sublevel 5 (Queen Candypop Bud available). Novice Training: Three on sublevel 1. Thirsty Desert: One on a raised plateau. Blooming Terrace: Four on the raised plateaus near the middle. Artwork of the Violet Candypop Bud. A clay model of the flower. This page was last edited on March 9, 2019, at 16:11.